Just as human bones get stronger when subjected to stress and tension, many things in life benefit from stress, disorder, volatility, and turmoil. What Taleb has identified and calls antifragile are things that not only gain from chaos but need it in order to survive and flourish. In The Black Swan, Taleb showed us that highly improbable and unpredictable events underlie almost everything about our world. Here Taleb stands uncertainty on its head, making it desirable, even necessary. The antifragile is beyond the resilient or robust. The resilient resists shocks and stays the same; the antifragile gets better and better. What's more, the antifragile is immune to prediction errors and protected from adverse events. Why is the city-state better than the nation-state, why is debt bad for you, and why is what we call "efficient" not efficient at all? Why do government responses and social policies protect the strong and hurt the weak? Why should you write your resignation letter before starting on the job? How did the sinking of the Titanic save lives? The book spans innovation by trial and error, life decisions, politics, urban planning, war, personal finance, economic systems and medicine, drawing on modern street wisdom and ancient sources. Nassim Nicholas Taleb has devoted his life to problems of uncertainty, probability, and knowledge and has led three careers around this focus, as a businessman-trader, a philosophical essayist, and an academic researcher. Although he now spends most of his time working in intense seclusion in his study, in the manner of independent scholars, he is currently Distinguished Professor of Risk Engineering at New York University's Polytechnic Institute. His main subject matter is "decision making under opacity," that is, a map and a protocol on how we should live in a world we don't understand. His books Fooled by Randomness and The Black Swan have been published in thirty-three languages. A little dense, but brilliant all the same. The author does rail against the anti-intellectualism of the modern world. In particular, he detests the dishonesty of modern academia, which he accuses of preferring theory over practice. And that practice should embrace the inherent variation of the modern world. This book is definitely confronting. But it is well-written and should be accessible to the general reader. This is the one of two books that has literally, and I mean literally, changed my life. The way Taleb reshapes how to view risk, finances, uncertainty, and every day life has had such a profound impact that I've made more progress on my personal goals the last three months than maybe the last three years. Highly, highly, highly recommend this book. This, and "Thinking, Fast and Slow" are my only two book recommendations I make now. 4.0 out of 5 starsA begrudging fan. Oh, Taleb. You make it so hard to not use vulgar language in my review. 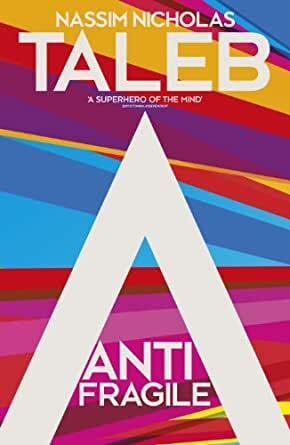 This book, which introduces and describes the concept of antifragility, is pretty revolutionary. Few books have fundamentally changed the way I think about the world, and this is one of them. My understanding of risk and how to address it has shifted dramatically, and the application of the concepts discussed has yielded surprising results. That being said, the author is as pretentious as they come. Expect a lot of fancy-pants language for no reason other than to show off, and off-topic stories to illustrate just how much better than the rest of mankind Taleb is. It is a frustrating read to say the least. It took me a couple months to slog through this book because of how frequently I wanted to punch Taleb in the teeth, but the content is 100% worth it. 238 people found this helpful. The idea of the book is very interesting and is filled with examples and anecdotes which help clarify the concept and its implications. It is very interesting how such an important concept with clear implications in multiple contexts has flown under the radar by academics and professionals. I have read other books by the same author, had high expectations and I wasn't disappointed. However, I cannot stop thinking that it could have been written in half the pages.His mix of informal prose, references to classic literature, self-congratulation, grandiose explanations, and real-world stories are tiring at some points. It took me much longer to read than usual because I often got saturated with his style. It sat at my table for months while I read four other books in-between. I wish there were a way to give more nuance when assigning starts to a review. 5 starts to what the book is about, 1 star to how is written. First of all, read the book. Whether you agree with Taleb or not, he has here a serious critique of serious things. Be prepared for a bit of a slog - the 5 stars is for the significance of his ideas, not his literary talent. Imagine striking up a conversation at an airport bar with a very smart, slightly drunk aristocrat who grew up in a war-torn Lebanon, returning from a conference full of people he considers spoiled and irresponsible Westerners. Press record. That's how the book reads. And that image in my head helped me enjoy the book. Taleb is utterly pissed off by an economic and political ruling class that he sees as oblivious to the fragility of the systems they are creating, and so to the catastrophes they are setting us all up for. The book is less a reasoned arguments than an impassioned rallying cry for people to stop drinking the cool-aid of economic and social quick fixes, attempts to overly-isolate people from the natural vicissitudes of life as well as from the consequences of their own actions. We learn and grow from the stressors of life ( up to a point), and this is how we become " antifragile". What I find especially refreshing is that this thesis really doesn't come across as being either liberal or conservative - Taleb isn't operating along that axis. He is arguing for us to re-value simplicity in systems, learning from and trusting our experience, taking responsibility for our actions, and being "heroic" in the classical sense of working for (and perhaps sacrificing oneself for) the good of others. It is a deeply traditional view, balancing the individual with society and with nature. Now be warned, this all comes at you in a somewhat inebriated tirade that bounces all over the map, from the mouths of Brooklyn bankers and (occasionally untranslated) classical writers, and illuminated by episodes from Taleb's globe-trotting life that can sometimes get a bit stale. But that's exactly how you have to hear it - the style is intentionally over-the-top and excessive, the "I'm mad as hell and I'm not going to take it anymore" of a former economic insider. But he has the saving graces of a sense of humor and a deep historical sense, that commands your respect more fully than just another pissed-off Fox New pr CNBC commentator with an axe to grind. 126 people found this helpful. This is the type of book which truly requires some introspection and reflection on your part. You cannot take this at face value and read it truly as a work of nonfiction. While you are reading, you must imagine how antifragility and all its domains work in your particular life and lifestyle. As Taleb relates at the end of his book, look around you – what is fragile and antifragile? What likes volatility; what dislikes uncertainty? And do you yourself like variation and disorder? That means you are truly alive. I haven't read many reviews for this book. However, I am sure that there will be a few who will complain about the grammar and syntax Taleb uses when writing the book. While disconcerting at times, you have to look past it. I wouldn't say this about most any author. In a weird sort of way, the variation in grammar and syntax truly makes you more of an antifragile reader! You are more inclined to go back and re-read many of the passages; you are encouraged to take notes. And, like most any book which is worth it's salt, it deserves a second and a third reading to truly grasp the full meaning of what the author is trying to convey.